In an intensely competitive global economy, more and more organisations are expanding into new territories and sending employees to work abroad. With AIG’s Group+ Business Travel Accident (BTA) insurance, employees are supported every step of the way, allowing them to focus on the job at hand. There’s always the possibility of getting sick while you travel. Even if you rarely become ill, you may want to consider these tips for an extra layer of protection on your next trip. Be situationally aware. Know what is happening around you, know what is and isn’t normal and if you do not feel comfortable in the area – get away. Sometimes travel leaves you exhausted due to different time zones. 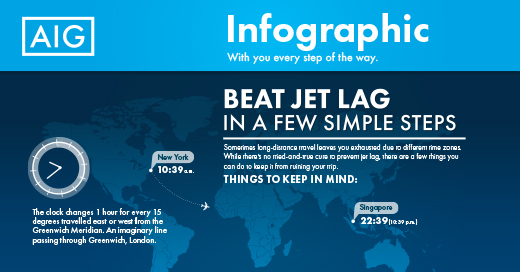 While there’s no cure to prevent jet lag, there are a few things you can do to keep it from ruining your trip. 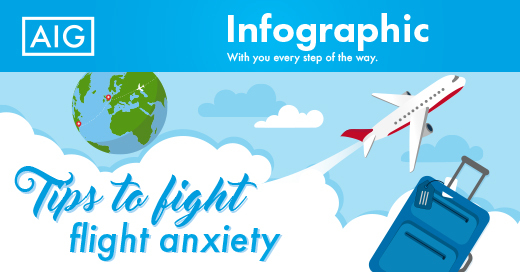 We’ve all been told that flying is safer than traveling by car to a destination, but that fact doesn’t always calm the pre-flight jitters of even the most experienced business travelers. Anyone can fall victim to identity fraud given the numerous methods of stealing personal financial information. We wrote an article about how to avoid becoming a victim of credit card theft. If your employees or facilities are impacted by a terror event, a corporate response should include three key pillars: Monitor, Communicate and Act. Communicating to employees is vital. AIG Travel Assistance has everything you need for a well prepared trip. Our website and app provide you with all the tools to travel safely. Organisations can rest assured that their employees are supported every step of the way, allowing them to focus on the job at hand.